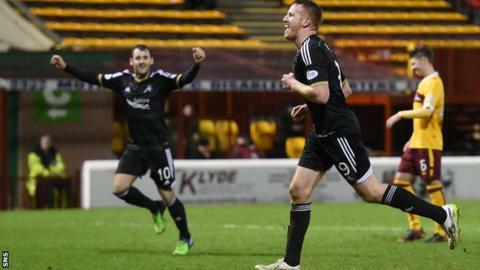 Aberdeen moved four points clear at the top of the Premiership after an Adam Rooney double gave them victory at Fir Park. The Dons passed up a number of chances before Rooney gave them the lead after clever play from David Goodwillie. Aberdeen continued to fashion chances at will but only sealed the victory a minute from full-time. Rooney stroked home a last-minute penalty after Stephen McManus was penalised for handball and sent off. Aberdeen had the game's first chance as Motherwell failed with a couple of attempted clearances. The ball ran through to Goodwillie, but his strike from just inside the box was straight at goalkeeper Dan Twardzik. Rooney passed up another great opportunity when he headed a wonderful Niall McGinn cross wide from eight yards out. Twardzik was called into action again, tipping a Johnny Hayes cross over the bar as it sailed towards the top corner. The first quarter of the match belonged to the Dons, but Henrik Ojamaa offered Motherwell encouragement with a powerful drive from 20 yards that swerved just past. Aberdeen finally made their dominance pay after 36 minutes. Goodwillie clipped a clever pass over the top for Rooney, and with the Motherwell defence caught out trying to play offside, Rooney rolled the ball under Twardzik. The Motherwell keeper was beaten again just before half-time, but McGinn's terrific curling effort from 20 yards struck the crossbar. Derek McInnes may have felt his Dons side deserved more than a one-goal lead at the break, such was their superiority in the first half. Motherwell were showing few signs of being able to find a way back into it, and Aberdeen had three excellent chances in quick succession midway through the second period. Shay Logan looped a cross to the back-post where Andrew Considine rose highest to head goalwards, but the ball came back off the post. McGinn saw his follow-up saved by Twardzik. The ball was kept alive but Peter Pawlett headed over the bar from 10 yards. Substitute Dominic Thomas tried his luck from long range as Motherwell searched for an equaliser, but his shot drifted well wide. The youngster then teed up Ojamaa but the Estonia international's effort was weak. Goodwillie spurned two great chances to double Aberdeen's lead in the closing stages. Ryan Jack carved open the home defence with a clever reverse pass, Goodwillie surged in on goal, but after riding a mistimed challenge in the penalty area from Mark O'Brien, he dragged his shot wide. Jack and Goodwillie combined again moments later, but the former Dundee United striker saw his effort deflected wide off the back of Twardzik. Aberdeen were awarded a penalty with three minutes remaining as the Motherwell defence buckled under constant pressure. Twardzik misjudged a cross and with the keeper out of the game, McManus blocked Hayes' shot on the goalline. Referee Willie Collum judged he had done so with the use of an arm and showed the defender a red card, leaving Rooney to stroke home his and Aberdeen's second from the spot. Match ends, Motherwell 0, Aberdeen 2. Second Half ends, Motherwell 0, Aberdeen 2. Goal! Motherwell 0, Aberdeen 2. Adam Rooney (Aberdeen) converts the penalty with a right footed shot to the bottom left corner. Stephen McManus (Motherwell) is shown the red card. Penalty conceded by Stephen McManus (Motherwell) with a hand ball in the penalty area. Substitution, Aberdeen. Willo Flood replaces David Goodwillie. Attempt missed. Lionel Ainsworth (Motherwell) right footed shot from outside the box is just a bit too high from a direct free kick. Attempt missed. David Goodwillie (Aberdeen) right footed shot from the centre of the box is close, but misses to the right. Ryan Jack (Aberdeen) wins a free kick on the left wing. Attempt missed. David Goodwillie (Aberdeen) right footed shot from the right side of the box is close, but misses to the left. Attempt saved. Henrik Ojamaa (Motherwell) left footed shot from the centre of the box is saved in the centre of the goal. Attempt missed. Dom Thomas (Motherwell) right footed shot from outside the box is close, but misses to the right. Attempt blocked. Luke Watt (Motherwell) right footed shot from outside the box is blocked. Attempt saved. Henrik Ojamaa (Motherwell) right footed shot from the centre of the box is saved in the centre of the goal. Corner, Aberdeen. Conceded by Mark O'Brien. Substitution, Motherwell. Dom Thomas replaces Fraser Kerr. Attempt missed. Peter Pawlett (Aberdeen) header from the centre of the box is close, but misses to the left. Attempt saved. Adam Rooney (Aberdeen) right footed shot from the right side of the six yard box is saved in the centre of the goal. Andrew Considine (Aberdeen) hits the right post with a header from very close range. Attempt missed. Jonny Hayes (Aberdeen) right footed shot from outside the box is high and wide to the left. Corner, Aberdeen. Conceded by Stephen McManus. Corner, Aberdeen. Conceded by Fraser Kerr. Foul by Luke Watt (Motherwell).